Successful organizations have world-class risk management. It’s time for you to implement Enterprise Risk Management. Active Risk Manager (ARM) is the world’s leading Enterprise Risk Management (ERM) software package. Unlike traditional, compliance-focused “GRC” solutions, ARM delivers far more value and capability to its users. With its robust and unique integrated approach, ARM is the only ERM solution that addresses the risk management needs of the entire organization. From managing project and program risk through to strategic business planning, ARM helps organizations identify, analyze, control, monitor, mitigate and report on risk across the enterprise. ARM is the award-winning core powering ERM in some of the world’s most respected organizations including London Underground, Crossrail, Lockheed Martin, EADS, US Department of Homeland Security, UK MOD, Saudi Aramco, Rio Tinto, Bechtel and Skanska. Combined with the full solution portfolio including ARM Risk Performance Manager, ARM Apps and ARM Unplugged, ARM offers a complete ERM solution with modules that add value to and increase the effectiveness of risk management within your organization. 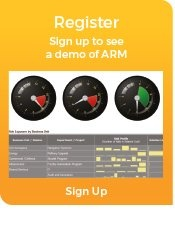 ARM makes Risk Management SIMPLE, VALUABLE, and PERSONAL for everyone in your organization. Automated alerts and dashboards provide greater certainty of business objectives such as earnings and cash flow volatility. Centralized risk registers eliminate disparate spreadsheets and other silos of risk information. Qualitative & quantitative risk assessments that capture both instinctual and objective risk. Direct and indirect loss management functionality enhances profit margins through targeted reduction of losses. Control libraries, templates and testing that provide assurance that current risk management processes and controls are effective. Provision management which helps control the early drawdown of contingency funds on projects and programs leading to on-budget project delivery. Advanced risk scoring and analysis display in risk heatmaps that help prioritize risk mitigation activities at a project, program, department or enterprise level. Centralized codes and classifications that drive processes consistency and adoption. Role-based views and apps that simplify data entry and viewing of risk information to accelerate process adoption. Every business is different, so ARM is designed to be flexible and configurable. Whether your organization supports risk management standards defined by the PMBOK, ISO 31000, COSO, FERMA or Solvency II, you’ll find ARM to be easily configured to support your unique requirements. With unmatched flexibility, ARM delivers the industry’s best value by shortening the cycle time of many risk management processes. ARM makes risk management personal by distributing risk management responsibility across your enterprise. This increases personal engagement from everyone in your organization, leading to more accurate and timely risk reporting, and more successful risk mitigation. Contact Us to schedule a consultation with the Active Risk sales team.